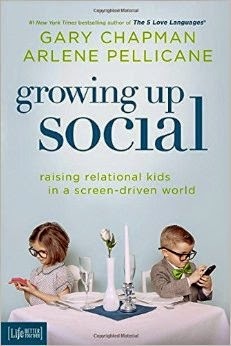 "Growing Up Social" by Gary Chapman and Arlene Pellicane is a book for any parent who wants to be "raising relational kids in a screen-driven world." "There is no app or video game that can replace interactions with other human beings." Relating to others, eye contact, conversation, empathy, getting along with others -- these are key characteristics that we all need in order to function effectively with others in our world. BUT -- "The average American child and teenager spends 53 hours a week with media and technology, far more time in front of screens than interacting with parents or people." That's a full time job plus some overtime! And what is the payout? Entitlement, low attention span and lack of patience are all results of excessive screen time. The book makes some obvious screen-related recommendations like "no more than 2 hours a day of screen time"and then goes on to explain things such as: ways to encourage creative play (get your kids a cardboard box!) and ways to increase a love of reading. As I was reading the book I summarized what I was reading to my kids and these A+ skills were a great conversation starter. We talked about which ones we each needed to focus on the most -- recognizing that we all have strengths and weaknesses. "Bonus Features" throughout the book include a Screen Time Family Pledge that will be an amazing springboard for family discussions. There is also a quiz that can help you identify whether or not your child has too much screen time based on his/her behaviours. The book even has a chapter that focuses on your own screen time and highlights the idea that we should model appropriate use of screen time for our children. Anyone who has enjoyed Gary Chapman's "The 5 Love Languages" will appreciate this book by Gary Chapman and Arlene Pellicane. You'll find this book inspiring and encouraging! Win it: One Sowing Dandelion Seeds reader will win a copy of the book "Growing Up Social". Our whole family struggles with too much screen time. As a stay at home mom to two three yr olds I find that when they wind down I wind down on the computer and when the teenagers come home from school they are online catching up with friends. Anger for the younger ones and Attention for the rest of us. Id have to sat anger & attention. Getting my kids' attention is my biggest struggle. I will be talking and my daughter is looking down at her phone or computer with ear buds in her ears and not hearing a word I said. My family and I need to work on appreciating others and paying more attention. My kids are on their laptops/phones all the time but so am I with my laptop so I'm not the best role model. But I do try to walk away. I think anger and attention would be what I need to work on. They don't talk because they are like zombies staring at the screen. It drives me crazy. I think we need to work on the Appreciate others skill. We struggle because it's more normalized in school now. Putting them down while interacting with others! We struggle because its "normal" and its hard to focus on that. We would like to focus on paying attention and being in the moment with them! I have to set firm limits or they will park in front of a screen for days. Limiting screen time can be a challenge! Appreciate others is one skill we all could improve on! We wan to have less screen time. My biggest struggle is that they always try to hide what they are typing on the screens. My biggest issue is setting time limits and holding myself accountable to the amount of screen time! Showing appreciation is one I could work on more within our family. When I really focus on it I see the difference in how our family reacts to one another. It's mostly them messing with and unplugging them.. nothing like addicted to electronics.